As the U.S. Marine Corps looks to move ahead with its multi-role, vertical landing and takeoff-capable drone program, known as MUX, Bell has unveiled a new, full-scale mock-up of its V-247 Vigilant unmanned tilt-rotor at a technology exposition at one of the service’s own bases. The company has been actively pitching the design as an option for MUX project, but it has a modular design that could make it appealing to other U.S. and foreign military services, as well. 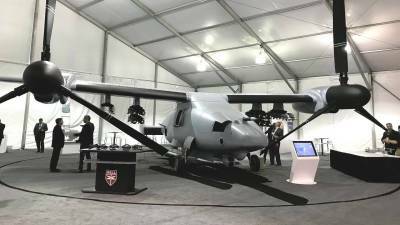 Bell showed the full-size model to the public for the first time at the 2018 Modern Day Marine Expo at Marine Corps Base Quantico in Virginia on Sept. 25, 2018. The firm first announced it was working on the V-247 design at all in 2016, around the same time that the Marines first revealed the MUX concept, which officially stands for Marine Air Ground Task Force Unmanned Aircraft System Expeditionary. Click here for the full story, on The Drive website.